The Hairy Bikers have spent the past few years criss-crossing the globe. We’ve watched these bearded besties sizzle, simmer and stew their way around the world’s kitchens, with plenty of their trademark banter along the way. 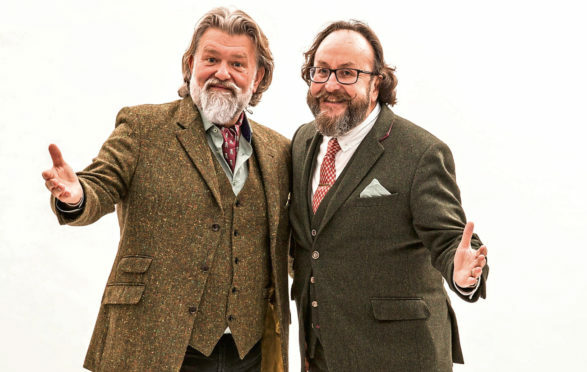 Just now, they’re in the middle of their UK tour – An Evening With The Hairy Bikers – but they’re already planning their next road trip. “It’s very important to keep our footprint as small as possible,” nods his pal Si King. “It’s easier in America, as their culture is more media-savvy, but if you’re somewhere like Morocco or India you need to be gentle. A quick look at my bookshelf would show all the countries the boys have been to but what have been their highlights? “Argentina for me, which is going back a while now,” says Dave. “We started in Buenos Aires – amazing beef, stunning seafood and wonderful culture – then rode down to Patagonia. “We had two days on our own, just me and Si on the bikes, with cans of petrol in the top box and a clean set of clothes. “We met the crew in a nature reserve roughly the size of Wales. In one working day, we filmed on a boat and saw 200 Southern right whales and calves in the bay, then a beach full of elephant seals about 30ft long. The boys are two of the friendliest fellows around, so it’s no surprise they’ve also loved encountering so many different people and cultures. “We’ve been around the world four times and there’s only 2% of it that’s barmy and nasty, everyone else is really approachable – and that transcends race, religion and politics,” adds Dave. “Whether it’s the best pies or the best sausages, they’ve all got something and in one form or other, you get talking. What’s obvious is just how much all this travelling has influenced their own cooking, as Si admits: “You’d have to be dead not to be influenced by it! “When we went home, the family would get to know foreign cuisine based on where we’d been. While most of their travels have been positive, Si recalls: “There was one night early in our careers when we checked into a hotel in India that was filled with bedbugs. “You were eaten alive!” Dave laughs. “There was another occasion – we were on our very first recce – and we’d booked into a hotel in Portugal. “It took us about an hour to find and it was one o’clock in the morning so there was nowhere else to go.